Available for 40 or 60 badges / ID cards (credit card size). Made from tough wipe clean ABS material. Racks are ideal for use in all harsh industrial environments. Holds swipe cards/proximity cards and photo ID badges. Indexing possible through a small margin on each side. Hold standard sized credit card swipe cards - 85.60 × 53.98 mm. Uk Time Solutions can provide two ID swipe card/badge rack panels to choose from and can display either 40 or 60 security cards in a portrait format. Our swipe card panels hold standard credit card sized ID cards or clocking cards or badges that are 55mm wide and 85mm high and provides the top 20mm of each card to view the name on the card. 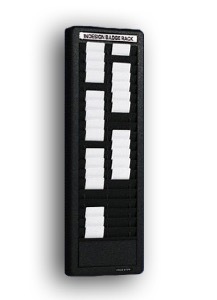 Therefore, they are perfect for displaying security passes and ID badges, as clocking in cards for attendance use. Each panel is supplied with a heading track and wall fittings. We are committed to supplying our customers with quality products at the best possible prices, so are confident you will find the perfect clocking cardholder to suit your budget.